The few toss-ups on the House map were much less likely than the safer seats to have been drawn through a process controlled by one party. 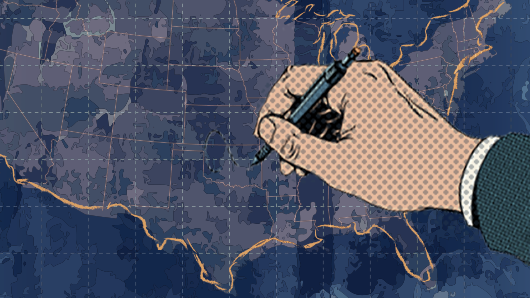 Districts drawn by lawmakers in trifecta states — states under unified one-party control — are nearly four times less likely to be toss-ups than districts drawn by courts, commissions, and legislatures under split control, a new Brennan Center analysis finds. It provides the latest evidence that if Democrats succeed in flipping 23 seats in the midterms to capture the House, it will be thanks in part to fairer maps drawn by courts and commissions. Two hundred twenty-three U.S. House seats were drawn by a state legislature and governor of a single party. (Seven seats are at-large, so they’re not included here.) Only 2.2 percent of those seats were rated by Sabato’s Crystal Ball as toss-ups, as of October 18. 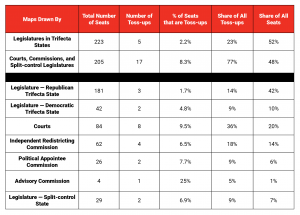 By contrast, over 8 percent of seats drawn by legislatures under split-control, courts, and all types of commissions were rated by Sabato’s Crystal Ball as toss-ups. 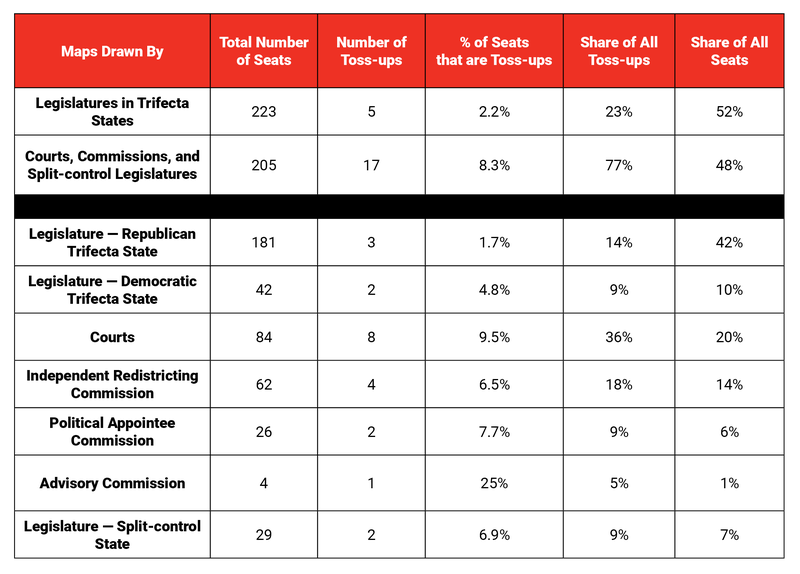 Put differently, courts, commissions, and split-control legislatures drew 17 out of 22 ultra-close seats. If legislatures in trifecta states had drawn competitive seats at the same rate, at least 13 more congressional seats would be in play. Broadly, we found that districts drawn by courts or commissions composed of political appointees were most likely to draw toss-up districts. Districts drawn by legislatures in states controlled entirely by Republicans were least likely to draw toss-ups.